City360tv.com host Matt Schumacker is back at this week. We celebrated Veterans Day this past week, After back to back weeks of playing Navy and Army we found it fitting to have a special edition Blue and Gold Weekly Review honoring our Veterans. Nice tribute at the end. Also, City360tv correspondent Lisa Kelly was in Texas for the Army game, she calls in with an update about the game. 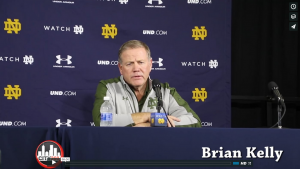 We have post game comments from Coach Kelly, player interviews and fan cam.